Friends! Another month is in the books. How was your November? Ours was rather quiet compared to a busy October, with the exception of having my mom visit, hosting a Friendsgiving at our place, and catching up on the Hunger Games movies in anticipation of Mockingjay Part 2 (any other Hunger Games fans out there?). Embarrassing admission: I didn’t read a single book this month – yikes! But I’d like to be better about that this month. Leave any favorite book (or podcast) recommendations in the comments! We’re diving head first in December soon. But before we do, let’s recap everything we made here on the blog in November, starting with eats! My favorites this month were definitely the Mini Pumpkin Pies, Vegan Thanksgiving Wraps, and Apple Crisp. Oh my WORD, that apple crisp. How about you? It was a little sleepy in the way of books and new-to-me blogs in November, but one thing that stuck out and greatly impacted my perspective on my relationship with food (and more) was this Jess Lively podcast with guest Isabel Foxen Duke. I shared it on Instagram last week and I couldn’t help but share it again for any of you who might’ve missed it. Even if you’re A-OK in the intuitive eating/emotional department (if so, go you), it’s a good listen for everyone. Check it out! In December I have some amazing healthier baked goods coming your way – think cookies and brittle (yasss, brittle) – as well as a few more hearty plant-based entrées. So stay tuned! See you back soon for a new recipe. These are making my mouth water! I really enjoy The Darkest Minds trilogy by Alexandra Bracken. Great books! I’m looking forward to your December recipes! I just love your recipes, they are often a lifesaver when I am too tired to be creative myself. Those mini pumpkin pies look so good. The problem with mini for me is that I’ll eat many-haha! Made your Pumpkin Pie Parfaits for Thanksgiving dessert. Delicious and just right! Those parfaits look so yummy! This month I made the stuffed poblano peppers and they were delicious. :) Like Leah, I just finished reading Big Magic by Elizabeth Gilbert. Here are two other recent reads that I talked about my blog, Tomato Vine Vintage. Thanks MB for all the tasty inspiration! Ooh, great tips Sara! I’m on the waiting list for Big Magic at my library. Can’t wait to get my hands on it! My Thanksgiving was chock full of MB recipes and it was awesome! Definitely the tastiest holiday meal I’ve ever made! Thank you!!! SO kind! Thanks for sharing, Dacia!! Thank you again for sharing this episode of The Lively Show! It’s wonderful to hear that it resonated with you so much!! Ooh, good suggestions! Thanks for sharing! I’m definitely looking forward to seeing some plant-based entrees for December. Our oven doesn’t have racks right now so baking isn’t so easy for us. Healthy baked goods are always a great treat though. I’m trying to help my family to eat better, and sweets are a nice touch. 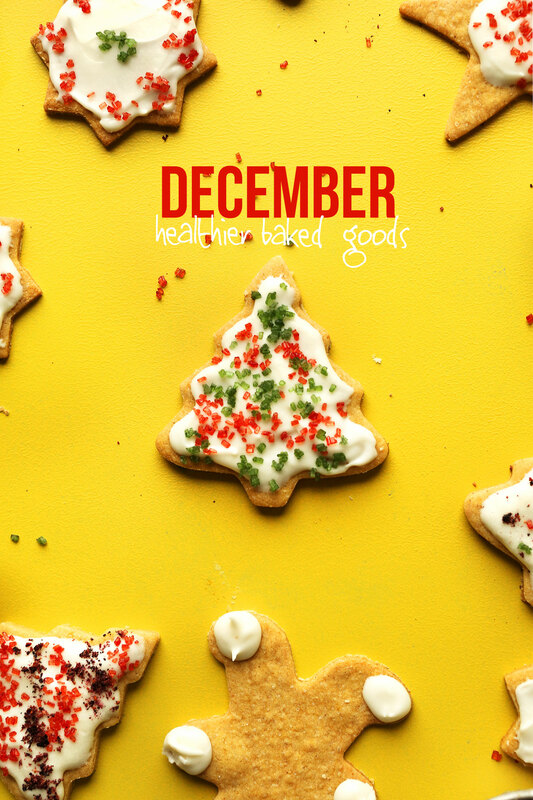 Can’t wait to see all the healthy desserts you create in December! For me December is the month to EAT ALL THE SWEETS so any added health benefits that can be added will be an amazing advantage! I’ve never heard of that book! I’ll add it to my list! Thanks for sharing. My mom and I are big Hunger Games fans and we cannot wait to see the last movie! I’ve read all the books and I’m encouraging my mom to read them too. I just saw the last one and it’s SO good! Hope you love it, too! Ooh, haven’t heard of that! Added to the list! Thanks for the tip! I have a bunch of leftover pumpkin, I may have to make those pumpkin muffins! Yum! The Stupidest Angel by Christopher Moore is a book appropriate for the holiday season! I was LOL-ing all over it last year. I swear I’ve listened to all the podcasts there are with Isabel Foxen Duke, she is seriously queen, so inspiring and just all around amazing. I’ve been reading a lotttt lately, some of my faves: Big Magic by Elizabeth Gilbert, It Was Me All Along by Andie Mitchell, House Rules by Jodi Picoult (and basically anything else by her), Eating Vietnam by Graham Holliday, Kitchen Confidential & Medium Raw by Anthony Bourdain *swoon*, Tiny Beautiful Things by Cheryl Strayed, Yes Please by Amy Poehler, Eating Animals by Jonathan Safran Foer. I feel like I could go on forever! Ooh, love all those tips! I’ve read Andie Mitchell, Kitchen Confidential, Yes Please, and Tiny Beautiful Things, but not the others! I’ll look into them!! YES, can’t believe it’s almost December! 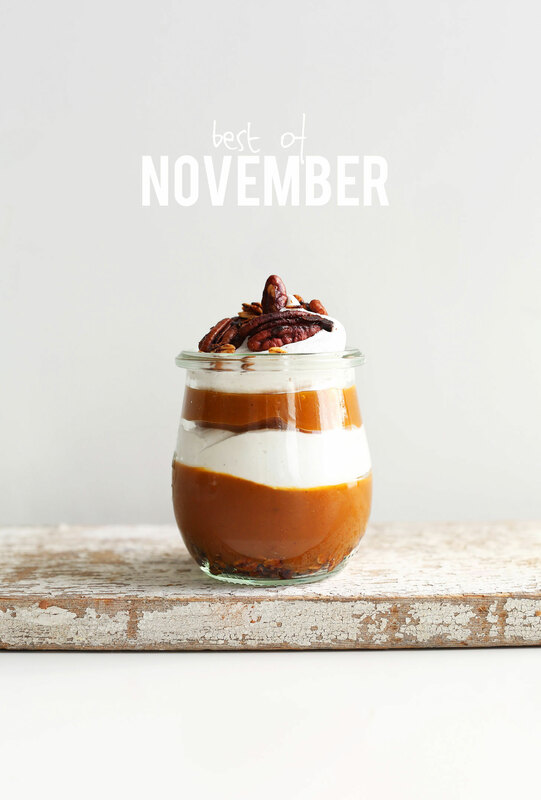 That pumpkin pie parfait is calling my name – yum! I definitely still want to try those pumpkin muffins and that apple salad. Can’t wait to see what you’ve got for us in December! A month full of deliciousness, as always! Love love love your recipes! Seriously making your pumpkin pie parfaits this morning. It looks like dessert for breakfast, and I am all for that!!! It could totally be that! I’ve been known to sneak a bite pre-breakfast ;D No shame!